I now have an Emergency Cupboard in addition to my Go Bag. This is for hunkering down. I wanted all my power outage supplies in one place so I don’t have to go searching around for them when the lights go out. 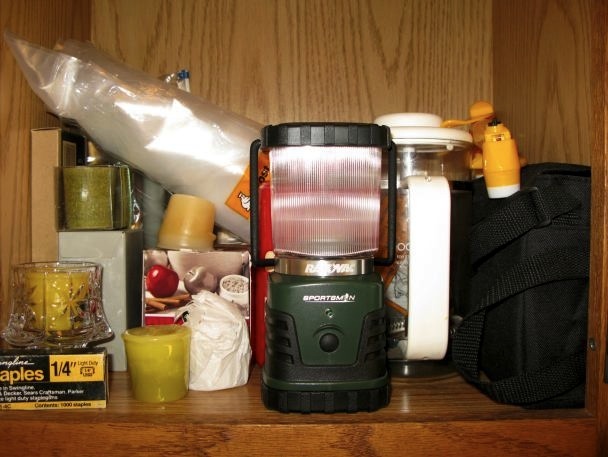 As you can see, I’ve got my battery operated lantern, battery operated radio, (that’s the black thing on the right) a manual coffee press, candles, plastic and staples in case a window is blown out … hmmm. That’s it, it seems. I’ve got a flashlight closer by on a shelf, and one in my purse, and a drawer full of batteries. Seems like I should need more stuff. What am I forgetting? Food yeah, but what else? Bottled water? Or is that a given as a citizen of NYC? You should definitely have water, ideally a couple gallons of it. And an emergency supply of cat food. And cash! Living in SoCal during the last big earthquake, there was no electricity for several days…no access to banks/ATMs, etc. A gun?? I surely would…. Wait….I did not think long enough….I got it….Catfood!! GUN????? (I’m very very very very clumsy. No one on the planet wants me with a gun in my hand.) But otherwise, great suggestions everyone, thank you! I’ve been thinking about switching my phone back to analog, and using my old dial up phone. The reason is that a cordless phone, which most of us have, relies on regular power to function. The old analog phones use phone company power, so that during a black out you still have a functioning phone. Good advice, Dan. While I have a cordless phone and a cell phone, when “disaster strikes”, those devices don’t work. I have an ugly beige analog wall phone in my kitchen which always works…I was in great demand from my neighbors during our big Northridge earthquake when they couldn’t reach out-of-state family members. Hummm…maybe subconsciously, my two cats’ increasing plumpness is in anticipation of that dire need you spoke of? Yeah, I have an old style phone which always works when the power is out.